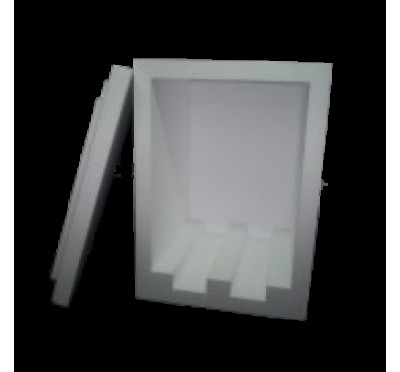 Polystyrene thermal cake box, of different sizes and heights. The polystyrene thermal cake box is used by bakeries for cake transport. The thermal cake box has a density of 15 kg / mc and the construction in polystyrene allows you to have a light and easily transportable object, as well as ensuring the preservation of the content inside. Our company offers polystyrene thermal cake boxes of different sizes. Below you can select the measure that best meets your needs. The polystyrene cake box is a thermal container suitable for transporting food. Thanks to its thermal properties and lightness, it is useful for cakes, mozzarella and food in general. The polystyrene thermal cake box is a container suitable for transporting food. The polystyrene of which the thermal box is composed consists of small polystyrene beads, which through a thermal process, called sintering, join together to form a closed-cell structure that holds the air inside. For this reason, the polystyrene of the cake box, in addition to having thermal properties, is breathable and impermeable to water, thus preventing the proliferation of bacteria or microorganisms. The thermal box is a valuable ally for transporting food, as polystyrene is one of the most versatile materials currently available on the market. The polystyrene, in fact, in addition to being very light and for this reason easy to handle, is a perfect thermal insulation that allows you to retain the heat and cold for a few hours and ensure maximum portability of food products. The thermal boxes in polystyrene are able to prevent delicate products from undergoing thermal changes that could alter their taste and quality, avoiding the risk of providing customers with a spoiled product. The polystyrene cake box is widely used in the food sector to transport food. This is because polystyrene is a highly hygienic material and therefore can easily be in contact with food. The polystyrene cake box is highly used by pastry chefs to carry sweets or pastries during a party, but not only. Many people who organize parties or events, especially in open spaces, usually entrust the buffet to a catering service. The only way to transport food in perfect safety, protected from shocks and thermal traumas, is to use a polystyrene cake box. Even food vendors often rely on polystyrene cake boxes to transport dairy products, food products, fish or meat, i.e. foods that need to maintain their ideal temperature during the hours needed to transport from one place to another. The polystyrene thermal cake boxes can prevent these delicate products from undergoing changes in temperature that can alter their taste and quality, helping sellers to keep the value of their company high, avoiding the risk of providing customers with a damaged product. The Styrofoam thermal food box are excellent workmanship. Our company with years of experience in the field of polystyrene processing and sophisticated hot wire machines for precise and accurate cutting offers a wide choice of sizes. Our catalogue of Styrofoam thermal food box, in fact, allows you to choose cake boxes in different sizes, to meet every need. You can choose heights of 23.5 inches and 23.5 inches, and bases of 24x24 inches and 28x24 inches.